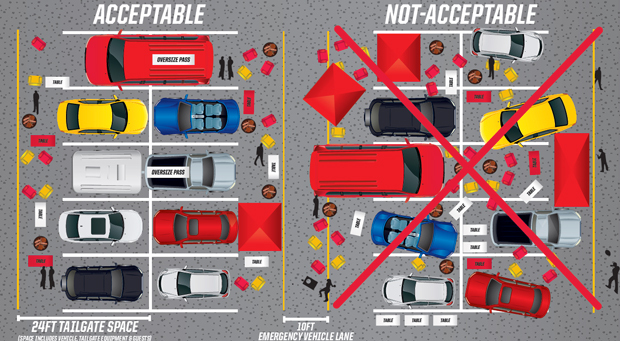 Painted yellow lines now adorn the Arrowhead parking lots to help improve tailgating safety. These lines instruct tailgaters to stay within an 8-foot area behind their parking space, and Chiefs personnel are treating them very seriously. Fans first staff members in golf carts will be navigating the lots to provide assistance to guests. The addition of yellow lines ensures that emergency vehicles have proper driving lanes in case medical attention is needed. 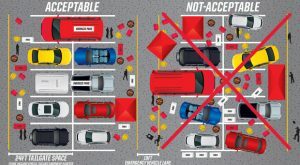 Therefore, if you have an oversize vehicle, you should consider purchasing two parking passes, or at least check the size of your pop-up tent before heading out to tailgate. Another change to Arrowhead parking is higher parking fees. If a Chiefs fan purchases a parking pass at the gate they now have to pay $40 on game day. Pre-paid single game parking passes are $30, and it costs $70 for an RV/Bus parking pass. The Chiefs want to cut down the time it takes to pay at tollbooths. The team is encouraging season-ticket members and single-game buyers to pre-purchase parking passes, which can be done up to 4.5 hours before kickoff, and 5.5 hours for rewards members. Buy a parking pass in advance at Tickets For Less to save you time AND money. The most notable change for Chiefs fans is the combination of two tiers of parking at the Truman Sports Complex. What used to be known as General parking (cash parking on game day) is now being combined with Red parking. By offering fewer parking pass tiers, it takes less time to sort vehicles and should keep traffic moving at a steady rate. This also incentivizes the earliest-arriving fans with spots closest to the stadium. Arrive as early as possible with a pre-purchased parking pass. Rewards members can arrive 5.5 hours early for the game. For a Noon start-time, early bird gates will open at 6:30 A.M. Regular arrival time is 4.5 hours before kick-off, and open parking begins four hours before kickoff. The Kansas City Chiefs offer Early bird arrival parking as a perk for Chiefs Kingdom Rewards members, but furthermore, it’s good to be aware of if you want to beat the rush or don’t want to get stuck in long parking lines, whether you tailgate or not. Make sure to arrive promptly- the closer you arrive to non-early bird arrival time, the more likely the early bird gates will be closed and you will have to wait in line with the general tailgating arrivals. One-gallon clear zip-seal bag (Ziploc bag or similar). Small clutch bags that do not exceed 4.5″ x 6.5″, with or without a handle or strap, may be carried into the stadium along with one of the clear bag options. This new policy went into affect when NFL stadiums decided to provide a safer environment for football fans and expedite fan entry into games. More information can be found at http://www.nfl.com/allclear. Leave your purse at home and only bring the essentials on game day.